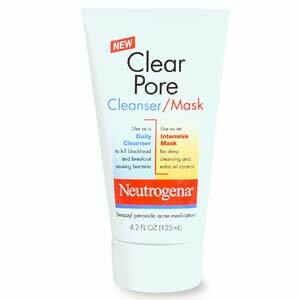 The only facial cleansers that work well for me are those that contain Benzoyl Peroxide and Neutrogena's Clear Pore Cleanser/Mask contained that along with Bentonite. I now switched to PanOxyl 8 which is a Benzoyl Peroxide face wash, but it doesn't work as well as the Neutrogena did. I noticed that one of the main ingredients PanOxyl was missing, that the Neutrogena contained, was Bentonite. So, I went out and purchased some Bentonite Clay from Whole Foods for about $8.00 I believe. To use it, you just mix equal parts of Raw ACV with the powder, apply to skin, leave on for 20 minutes then rinse with warm water. I read some very positive reviews on this product and tried it out on Saturday. My skin felt great afterwards and so far I have not experienced any negative side effects. I plan on using it weekly. The great part about this purchase is that I can use the Bentonite Clay for my hair to clarify and the ACV to do my rinses after work-outs. When a facial or clay poultice is applied to the skin it forms a negative charge. Poisons and toxins stored in the epidermis have a positive charge - Aztec Secret Indian Healing Clay lifts the pimple and blackheads into the clay bed to cause accelerated healing and nourishment to the skin with over 50 minerals.100% NATURAL. Does anyone else use Bentonite Clay for their skin? Thanks for the tip about the tea tree oil. You have me so much more excited to be using this! I have used both Bentonite and Rhassoul clay on my skin..usually when I am deep conditioning my hair..it's usually a mixture of Greek yogurt, organic ACV(with the mother),molasses, Rhassoul clay, I recently added hemp seed oil and argan oil just for giggles last week and .it felt great on both my hair and face..I LOVE CLAY!!! I just had to shout it.. I have also made a bentonite cassia bar that is pretty delish..and not just because it also has black cocoa powder but because of the unrefined cocoa butter, cassia obovata,and extra virgin olive oil..but that's a story for another day! You make such great/interesting mixes! I want to try out Rhassoul clay as well. Lol..I'm glad you love Clay..gives me hope that I may too! that Bentonite Cassia bar does sound delish! By the way, it's a little off subject, but that apple cider vinegar does wonders if you get a stomach ache or heartburn..clears it right up, just take a tablespoon of it. Just thought you'd like to know! I'll let you all know how it works for me. I never tried dead sea scrub..surprisingly. Yes, Neutrogena is the best! I'm so upset they discontinued that face-wash.
Ooh I never used ACV internally, but I should! Thanks for the tip!!! I use this on hair and skin and I love it. Using the raw acv makes a difference, in my opinion. My hair likes this every few weeks! That's great! Good to know. Can't wait to see the progress in my skin.